We are all picking up energy from other people every single day whether we are aware of it or not. This is why we can sometimes feel run down, lethargic and plain "out of whack" by the end of a day. Choose the people you hang out with. Make sure they inspire you and lift you up. If not, prepare to remove their heavy energy from yourself daily because it's imperative to your own health. The best part is, it only takes a minute. How? By learning more about your own energy with the Chakra Energy Healing Online Course. We all pick up energy every single day. There are no exceptions to this. Everything is energy. The news on TV has an energy to it. People you interact with are energetic vibrations walking around. Food is energy. Music, stories, animals, movies, absolutely everything is energy. Realise that when you are thinking about things that make you feel good, your energy is vibrating at a higher, more positive frequency. When you are thinking about things that make you feel bad, you are adding blocked or imbalanced energy toward your chakras. Stop it! 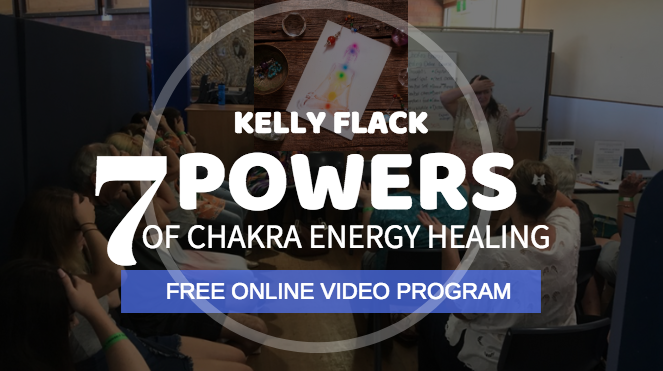 During this comprehensive online course, Kelly will give you the complete process to achieve chakra energy healing for yourself and your loved ones in the shortest possible time.